We were sent the Button Rose Grobag from The Gro Company to review. 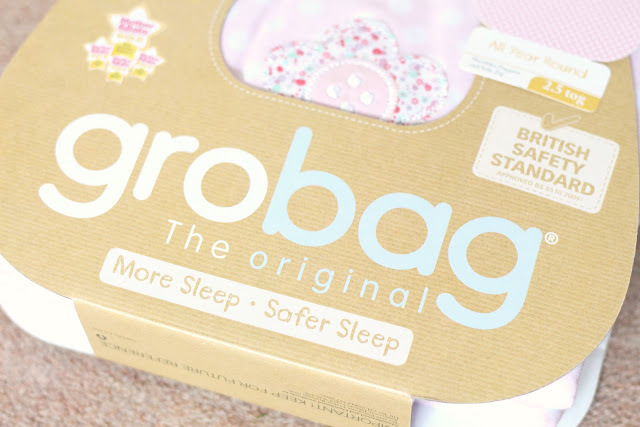 The Grobag is a sleeping bag designed for use from birth to 3 years as an alternative to using blankets and sheets for a safe nights sleep. Ever since Amelia was born it has always been a struggle to get her to sleep. No matter what i'd try she would always resort to nursing to sleep. So when I found out about the Grobag I was literally kicking myself in the teeth! The first thing I love about the Grobag, is the packaging! I was immediately drawn towards it when it arrived. It would make a perfect gift for any new mum. Also included is a thermometer to ensure you have the right size tog for the temperature of the room, or so you can adjust the temperature to meet the tog size. I think this is a great idea and will save you going out and buying a more expensive thermometer like the GroEgg which we don't use anymore. The Grobag goes over your babies shoulders and the zip goes all the way down the side to the bottom on the bag. It leaves your babies arms and head free. It's great because they can kick all they like and they won't get cold. I like that the zip and button are on the side which means your baby can't crawl out of the bag or get it trapped around their neck. The design of the Button Rose is really girly and pretty. 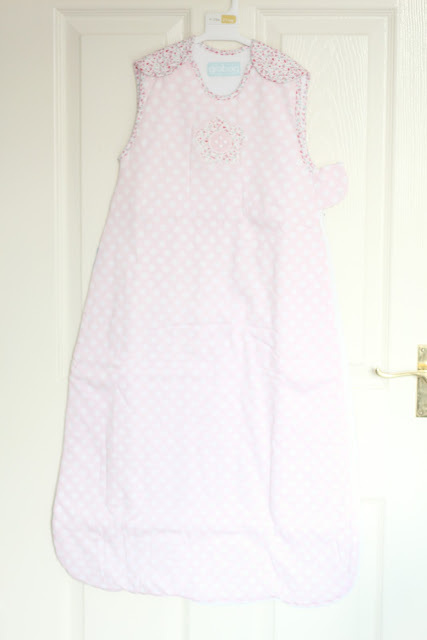 The front is pink covered in white polka dots with a flower button in the center and the back is covered in coloured dots. I just love the print! I wish they did it in an adult size, i'd definitely buy one! We were sent the Grobag in a 18-36 month size and 2.5 tog which will is great because it will last Amelia right up until she is nearly 2 and will see her through the winter. The sizing is really generous and I would imagine the other sizes to be too. The best thing about the Grobag for me is that I know Amelia will be kept warm all night long in it. Where as if she were sleeping with a blanket she would probably kick it off. The only negative I have to say about it is it's hard to get a sleeping baby into it. It may be easier for a newborn but for a baby who will only nurse to go to sleep it is impossible! Not a fault of the Gro company, it's just the way Amelia's always been. 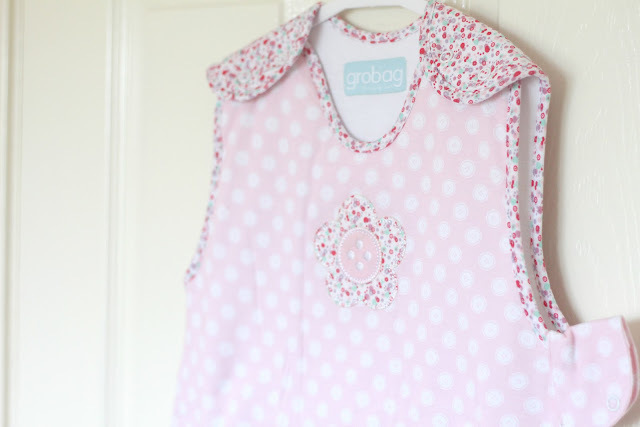 Another bonus of the Grobag is that your baby can fall asleep wearing it in the pushchair and they are ready for bed, also for transferring them from one place to another when asleep. I really wish we had used one from at an early age as I just Amelia would have slept much better in it if we had. 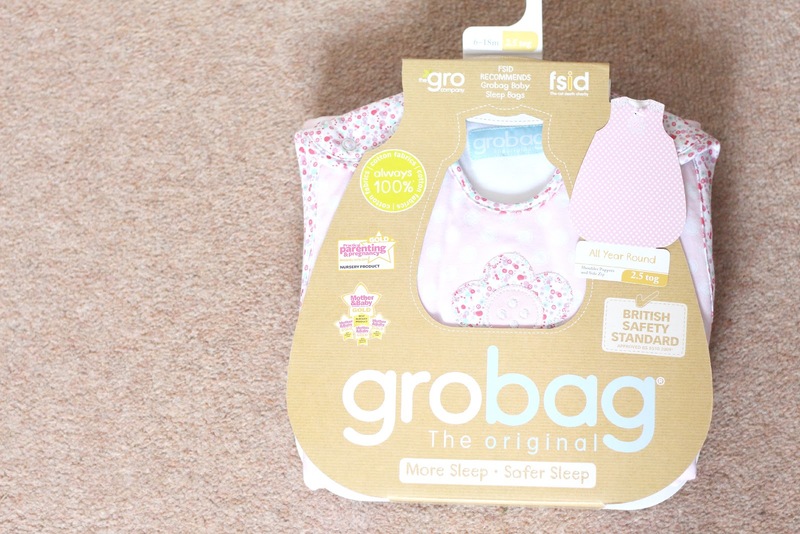 I would highly recommend the Grobag to any parent especially if you are trying to get your baby to sleep alone at night in their own bed. * Keeps baby covered and warm all night long. * Don’t have to worry about baby going under the sheets or kicking off the covers. * Comfort and warmth for hot or cold weather. * Makes it harder for baby to climb out their cot. * Stops babies feet from getting cold or stuck in the cot bars. You can find The Gro Company on Facebook and Twitter to keep up to date with their latests deals. *Item was sent for the purpose of the review. All opinions are my own. For my full disclosure please click here. We have a grobag for my little one but it's not as cute as this! I love this design! I don't think I could have survived my son's first year without a baby sleeping bag. He loved it. They're so cosy inside, which gives babies a massive feeling of security.